RSPCA Australia says the Australian Government must take urgent action to extend Exporter Supply Chain Assurance System (ESCAS) protections to breeding and dairy cattle extended overseas. ESCAS conditions do not currently apply to the tens of thousands of breeding and dairy cattle exported from Australia each year, and apply only to the export of feeder and slaughter cattle. ESCAS rules require exporters to maintain full traceability and ‘line of sight’ on all feeder and slaughter cattle they send overseas right through to the point of slaughter, and to ensure they are handled and processed only through facilities and abattoirs accredited to Australian standards. The export industry has previously argued that it would be impossible to maintain ‘line of sight’ for dairy and breeding cattle through to the point of slaughter as they can be dispersed widely in export markets and can live for many years before processing. The RSPCA has described the lack of ESCAS protections for breeding or dairy stock as a “gaping loophole”. The catalyst for its call today is an ABC report showing images and footage of starving, sick, dead and dying dairy cattle exported by Wellard from Australia to Sri Lanka. The RSPCA said it highlighted the loophole when ESCAS was first introduced in 2011 and had repeatedly called for the Australian Government to close it. The RPSCA said a previous ABC investigation in 2012 also revealed horrific conditions for Australian dairy cattle live exported to Qatar, with hundreds dying as result of not being provided with adequate food, water and shelter in the desert conditions. Two weeks ago Wellard released a statement reporting the mortality rates of two shipments of dairy heifers to Sri Lanka, saying it was making changes to farmer selection criteria in the dairy heifer export program with the Government of Sri Lanka. 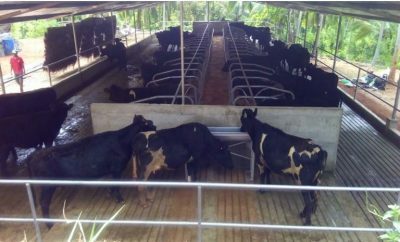 In 2014 Wellard was awarded a contract to supply 20,000 dairy heifers to the Government of Sri Lanka, and to provide technical support to the farmers who applied to the Government to receive cattle. It said the dairy export program has successfully reducing the developing country’s reliance on imported, powdered milk, was fostering the growth of the Sri Lankan dairy industry and its support services; and was helping to upgrade the Sri Lankan dairy industry’s herd management skills. The statement on March 18 said Wellard had provided two shipments so far, 2000 heifers in May 2017 and 3000 heifers in December 2017. The first shipment recorded 95 mortalities, a mortality rate of 4.8pc, and the second shipment had 331 mortalities, a mortality rate of 9pc. It said four of the 68 Sri Lankan farmers selected by the Sri Lankan Government to receive some of the 5000 cattle shipped farms recorded mortalities from that shipment. It said the farmers had failed to follow the prescribed herd management advice processes, which had caused some animal welfare issues on those farms, and for this reason farmer selection criteria would change in future. In its statement Wellard said recent research literature indicates that the mortality in dairy herds in developed countries with high culling rates around the globe is 6-7pc. It said Sri Lanka was a developing country with low culling rates, with heifers in the shipments being first calvers. In the statement Wellard chiarman John Klepec said the Sri Lankan farmers where mortality rates had been recorded were ignoring advice, particularly on nutrition, and animal health is falling to the point of mortality. Inspection of the Government-selected recipient farmer’s facilities to ensure they were suitable and safe for the animals before they arrived. The health and production of the heifers is monitored by veterinarians and technical advisers throughout the duration of the project. “The due diligence, training and oversight undertaken by the Sri Lankan Government and Wellard has worked in the majority of circumstances but has failed in a few. We strive for 100 per cent success and the changes we will make will help us progress towards achieving that goal,” Mr Klepec said. It said 84 million litres of milk had been produced by the cows since the program began (including the pilot program in 2013), replacing US$32 million of milk powder imports for Sri Lanka. Wellard said that although tethering was an accepted part of herd management in Sri Lanka, it had not delivered heifers to any farms where tethering was performed. As part of the selection of eligible farmers to receive the Australian and New Zealand cows, the Ministry did not allow heifers to go to farms that tether cattle. “We are proud of our role in helping developing countries provide nutrition to their citizens and to increase the herd management skills of local farmers,” Mr Klepec said. “Sri Lanka is a developing country and we cannot expect them to reach Australian standards overnight. They will however get there. “Already the number of feed manufacturers has doubled, there are new veterinary medicine, pharmaceutical and dairy equipment suppliers companies in the country and more than 5000 farmers have attended herd health and nutrition training programs. So the program is causing positive change. Shadow Minister for Agriculture Joel Fitzgibbon said the Dairy Cow Program was made possible by a facility provided by the Federal Government’s Export Finance Insurance Corporation, and called on the Minister for Agriculture David Littleproud to reassure the community that animal welfare standards are being enforced. He said Sri Lanka incident highlighted a gap in the regulatory regime which offered no assurances on animal welfare for the export of non-slaughter animals. “A Shorten Labor Government will address that gap,” he said. “We will also review the powers in the relevant legislation which currently denies the Regulator any power to test the likely welfare outcomes of non-slaughter live animals in export markets when issuing an export permit. The cruel end to those hundreds of dairy heifers exported to Sri Lanka is a disgrace and a stain on this country for sending them there. .As usual it is a case of just ship them out and don’t bother what happens to them after that. The live exporters and farmer organizations in trying to pretend none of this cruelty was happening are to blame for the rage that now is growing in the community over such issues as these poor dead heifers. Shame on this government and shame on the live export companies who have gotten away with so much for so long. I am only an average educated Australian, proud of my country and its standards and principles, but am appalled by the fact that the Exporter Supply Chain Assurance System does not apply to all animals exported live from Australia and will never stand by and say nothing about issues like this. think about thousand of the cattle farmers families think about thousand of children in Sri Langka need the milk. you are cruel to those thousand families. Most of us like animals like you guys. Please think wisely before you make a comments. Encourage your families and friends be a vegetarian that is what more significance. I am sick and tired of the export companies trying to convince Australians live export is humane. The cruel end to those hundreds of dairy heifers is a disgrace and a stain on this country for sending them there. . As usual it is a case of just ship them out and don’t bother what happens to them after that. And I am sick of sites like this which just delete comments like mine which justifiably express outrage at the on going disaster that the live trade is. The fact that the animal industries try to silence the concerns of people like me, in the hope we will all go away, and leading to more of the same old same old, is one of the main reasons for the rise of the more activist groups opposing animal agriculture. The live exporters and farmer organizations in trying to pretend none of this cruelty was happening are to blame for the rage that now is growing in the community over such issues as these poor dead heifers. Shame on this site for its censorship, shame on this government and shame on the live export companies who have gotten away with so much for so long. So go on hit the delete button, make sure voices concerned about this trade are not heard, and don’t complain then that frustration at the lack of action by farmer groups, companies and the Government gives rise to more activism. I was a peace loving livestock farmer, but I will never stand by and say nothing about issues like this.